I’m fairly certain that you don’t feel like cooking when the heat index soars. No one really does, and even though we’re still a bit behind on our growing season, the bounty at the Farmers Markets is such that you can arrive home, dripping from a hot, steamy walk among the tables with an overflowing sack of fresh vegetables and make something cool, refreshing and satisfying for dinner without turning on your oven. 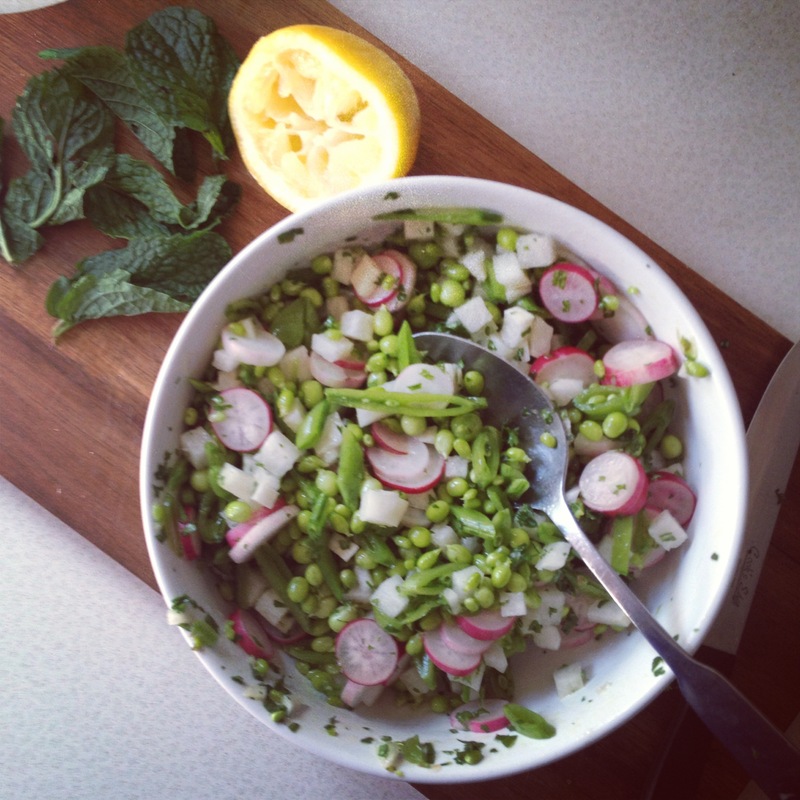 Like this raw pea salad. 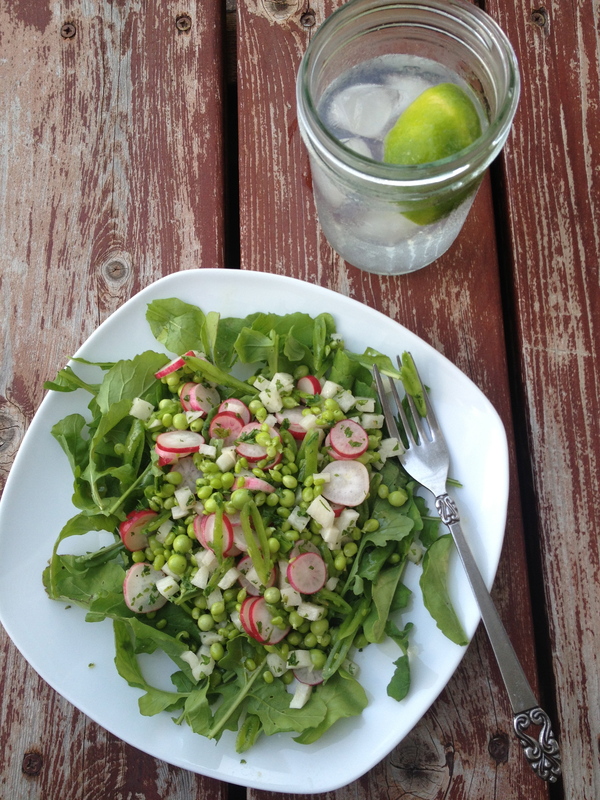 Last Spring I stumbled upon this idea for a fresh, raw salad with Spring peas and for a few weeks, it seemed to be all that I wanted to eat. Once the idea settled in my head, there wasn’t much to stop it, and coupled with ultra-summerlike weather, the kind that feels like it grabs a chokehold around your throat, it made mealtime a lot more pleasant. Recent trips to the outdoor markets are leaving me a bit blue, with the lack of available produce for late June. 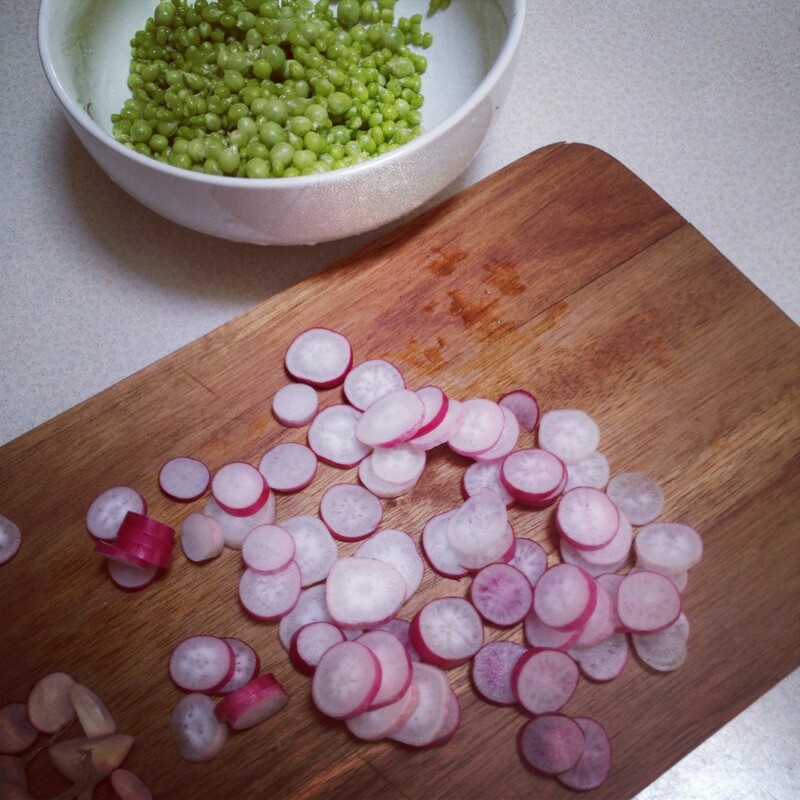 One can find, thankfully, plenty of good peas and hearty radishes, however, and that’s all you really need for this. The addition of cucumber and jicama adds a lot, though. But alone, the peas, the radish and some fresh herbs showered over the top really are all you need, especially if you’ve got a bag of good greens hanging around to scoop this over. We used an arugula and sylvetta mix from our CSA as the base for this salad and the sharp, pungent bite of that was so perfect. My eagerness to stir together a large bowl of this was frayed at the edges upon discovering that the peas I purchased weren’t full of plump and juicy little orbs liked I’d hoped. Even though the vendor vehemently told me they were perfect for shelling, what I found, while they were deliciously tender and fresh, was not the size, nor the amount I’d hoped for, so I set aside a large handful of the pods that were too thin and sliced those up to add more crunch and heft to this. It was just enough for the two of us to share as a full salad, complied with other options from our fridge. And sitting outside on our faded redwood steps, a cold, icy and weeping gin & tonic next to me, it served its purpose. Relentless Summer had descended, and still, the heavy rains fall. We’re more saturated than I could ever have imagined, and the air is thick with humidity. Truthfully, I love it, as a month ago we were still struggling to get out of the 60’s. The best part about my very favorite redwood steps, is that even in the hot afternoons with the sun still blazing, they face East and provide a shelter of sorts later in the day for sitting, with our sunroom at my back. It’s also the one spot out there where I can sit and not be seen by any of our neighbors. I perch here often, plate or bowl in hand, and in the mornings, before the sun passes it’s tolerable limit, it’s my preferred breakfast spot. Eli comes out and drops down on the brick, rolls to his back, kicking his big feet in the air; I can hear my husband moving around inside the house, but out here I have some peace and reverence to begin my day, or wind it down. I can stare at my garden, breathe in the summery air and just be. In a large bowl, combine the peas, cucumber, jicama and herbs. Whisk together the oil, lime juice and zest, cumin, salt and pepper. Adjust to taste and pour over salad. Stir to combine, adjust salt and pepper. Chill for an hour before serving; taste for seasoning. Can be eaten alone or atop a bed of greens. I love the pungent taste of arugula with it.